Others will probably disagree, but I prefer the old look. This may be because I am a stick in the mud, (after all I still use a K6-3+ for my main computer); but I find it visually confusing, and less user friendly than the way it was. Being a slow learner, I generally dislike change for the sake of change, once I have figured something out, I like it to remain familiar, so I don't have to go through the learning process again. It really isn't all that different, but it looks different, so I have to refamiliarize myself with what is what. Might add that although the old colours were kind of plain jane, I nonetheless preferred them to the new scheme. The downtime the site had a day or two ago required a reinstall of the softwares used by the site and the forum. I went ahead and updated to newer versions while I was at it. This has caused the slight problem of getting a compatible version of our old theme, which is no longer free. Understand that this look is just temporary while we figure something out. In the meantime if you go in to 'My Account' you'll be able to choose from around a half dozen themes that come with the software. We're also open to suggestions. WoW !! It's been several months since I've been here, and when I stopped in (last Friday 06/17/05) I was pleasently surprised by the "New Look". I like it, I like it alot. Front page looks absolutely Stunning. Good Job. I know what you mean about not liking to (resisting) change. I hear you bud. Thats why I "STILL" have not upgraded from Windows ME. I even got a brand new OS still in shrink wrap (Windows 2K Pro) that I bought from NewEgg about a year ago thinking that I had better atleast get aquainted with the "NT Kernel", but there it sits. What's a guy go'in ta do. It's good to see that atleast 1 other person feels kind of the same about change, I was thinking that I was just getting lazy. It just seems like a hastle to go to another OS right now with everything working so sweet just like it is, ya know ? BTW Nohr as always K6plus rocks! Thanks guys, I like it too. Keep in mind that K6Plus was all Relay's idea. I just hold the fort down. 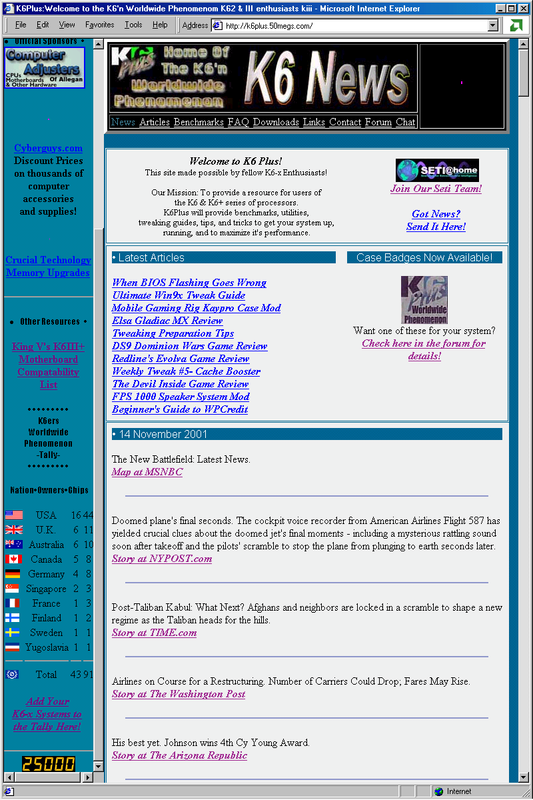 For contrast here's what K6Plus looked like circa November 2001. Ah, Yes. Those were the dayz. We really tore up the chat room back then. This site has really evolved since, and looks like for the better. I guess I haven't dropped by since '04 sometime. Where does all the time go to ? Yep, I remember. It was You, Relay, Toast, and Neo-Blue (kind of a Splinter Cell from the "Zone"). From very humble beginnings when ALL we wanted to do was concentrate on our beloved K6+ systems (I still got mine, I'm customizing the front of the case right now). Back then I thought the site was "Cool", now it's "Old School Cool". From what I see on the web (keep in mind that I don't see everything), this is a "one of a kind" Site that STILL has a need but is kept looking current and up to date with the times. You do a good job with the site Nohr. You are a worthy "Custodian and Keeper of the K6 way of Life". May you Live Long and Prosper. Ahh you give me too much credit. I'm sure more could be done with the site but it hasn't been a priority as of late. You guys here in the forum helping each other out on a daily basis is what keeps the site going. I just post news! Still a K63+ owner and user. The site is fine and must require time and effort to run and keep running.